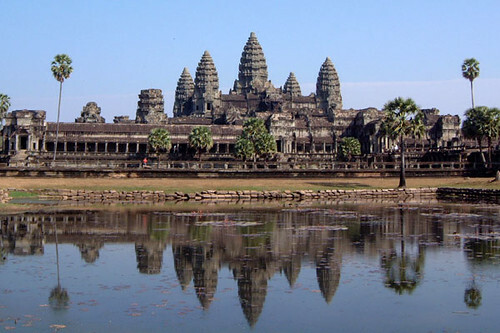 The Khemer kingdom of Cambodia, known for the construction of magnificent temples like Angkor Wat, had a domain that extended from south Vietnam to Yunan China in the North and westward till the Bay of Bengal. The city’s economy was based on rice and a network of reservoirs, canals and bridges were built to move people and goods. The Khemer engineers changed the direction of rivers for growing rice. The water system had canals in the North that funneled water into the city center and then from the city center a series of distributor canals sent water to the southern region. The general reason mentioned for the demise of this kingdom is an attack by the Thais in 1431. But now scientists think that the demise happened much before, due to the evils of urban societies, like ecological failure and infrastructure breakdown. Now there are more discoveries on what happened to the Khemer kingdom. A ground sensing radar provided by NASA has revealed new information about the Khemer kingdom. We now know that it was larger than present day Philadelphia and Phoenix, but with much less population. This radar has also identified new man-made ponds and long lost temples in this preindustrial low-density complex centered around the Angkor Wat temple. There is more evidence that the fall of this civilization might have been due to over exploitation of land. “Our research shows that Angkor was certainly extensive enough, and that land-use was certainly intensive enough, to have impacted profoundly on the regional ecology,” Evans told LiveScience. Angkor was surrounded by a vast expanse of rice fields that would have required extensive forest clearance. Over time, the intense farming could have led to serious ecological problems, including those associated with deforestation, overpopulation, topsoil degradation and erosion. The consequence of overexploiting the environment isn’t the only lesson Angkor’s fate has for modern society, Evans said. Angkor required a massive infrastructural network of canals and roads to keep it running.